This Mayan hand woven ikat runner is a one-of-a kind weaving! This weaving is the work of individual Maya Kakchiquel weaver who creates a color scheme, inserts ikat thread into the weave and applies a color/weave theme that no other weaver can easily replicate. The Maya hand Woven ikat runner is hand-made using the traditional Maya Kakchiquel ikat (tie dye) weaving technique. The runner is made of cotton and acrylic thread and is categorized as a “vintage weaving”, thus it will not be in perfect “like new” condition. 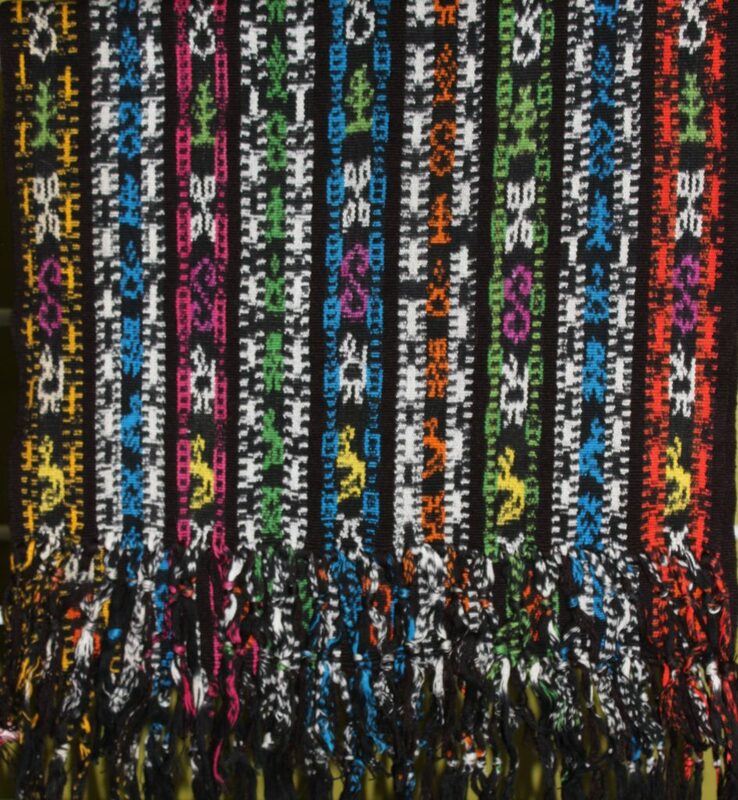 The Mayan hand woven ikat runner weaving was created (woven) on a back strap loom, by Elena Cuc, Maya Kakchiquel who lives in Solola, Guatemala who provides textiles to Maya Color. The weaving is 62.5 inches wide x 16.5 inches wide and has strands of multi-colored threads on each side. Although the weaving is vintage, it is durable, has a tight weave and is made with high quality threads, thus it will last many years. 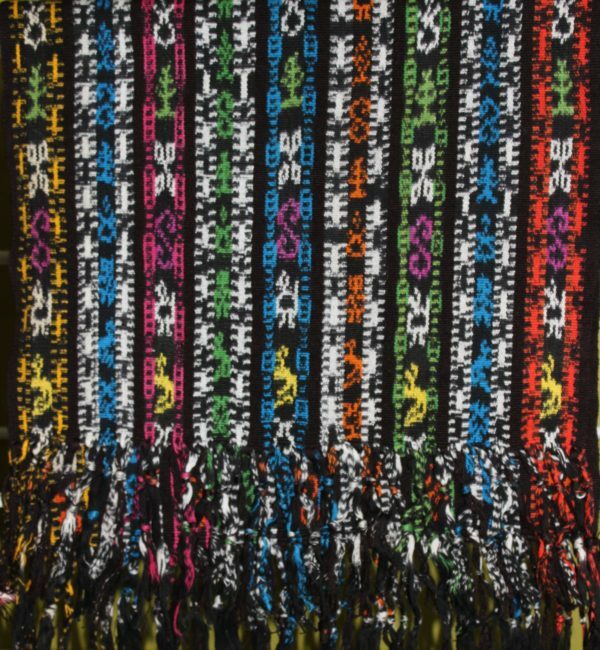 This unique ikat weaving can be used for in variety of ways. It can be used as a shawl, a cover for table, hung on your wall and a center-piece for a coffee table, draped over a door. Whatever you chose to use it for, it is an extraordinary woven art! 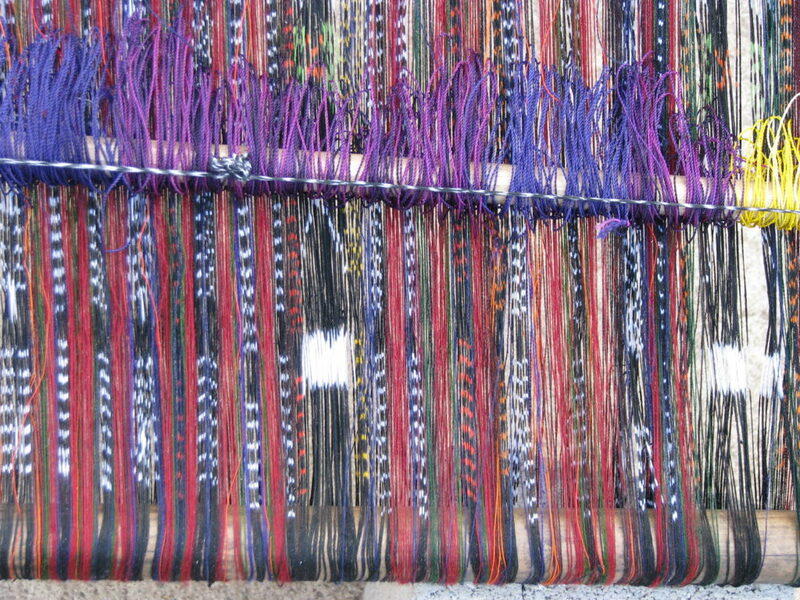 The ikat technique involves binding and knotting the multi-colored threads to achieve a specific pattern by soaking certain colors in the dye bath, then rinsing the thread, and then un-tying the threads. Once the threads are untied, the matching pattern of the threads with a specific design or motif is the end result. Once the strands of dyed threads or “jaspes” are dried they are ready for assembling or inserting into the loom. When all threads are inserted onto the loom, the warp is ready for weaving. Creating a weaving utilizing the ikat technique requires complex mathematical calculations and precise concentration.